Arni me Melitzanes sti Gastra, which means Lamb and Eggplant Casserole, is a delicious stewed dish which is easy to make and makes a perfect Sunday lunch meal. The meat becomes so tender that it falls, off the bone with a delicious sauce to mop up with crusty bread or served on pita bread. It goes well with Bulgur Pilaf and Greek Yoghurt. My mom would cook lamb or goat on the stove top with eggplants and make a stew. Growing up in Cyprus, lamb was a very popular meat. I don’t know if it was cheaper than other meat but although our family was poor, my mother would cook many dishes using lamb, so I guess it must have been cheap. There was a time that I was not really fond of lamb and would eat it only during Easter or during Christmas or New Year’s day but now that it’s become so expensive for us, I appreciate it much more and whenever I find a bargain, I buy some. The last time I bought some lamb I made this dish my way, by frying the eggplants, adding the olive oil gradually so that the eggplants will not absorb a lot of oil. I then sauteed the lamb and made a tomato sauce using ripe tomatoes, onion, garlic, celery, rosemary and spices and put them in a casserole dish with a lid and cooked the lamb. Wash the lamb, let it drain and cut it into pieces. Wash the eggplants and dry them. Preheat the oven to 200o C (fan forced with upper and bottom elements on) and place the oven rack on the lowest place. Heat 1 tbsp olive oil in a non-stick frying pan. Cut the eggplants in 1 inch slices and sauté them on both sides. If they dry, brush them with olive oil. Remove to a platter and repeat this procedure with the remaining eggplants. Add 2 more tbsp olive oil and sauté half the lamb. Wait until it is browned on one side and then turn over. Continue with the remaining lamb. As some fat will come out from the first batch, do not add more oil when sautéing the remaining lamb. . When done, put the first batch back in, add the wine and cook for a few minutes for the alcohol to evaporate. Remove to a crock pot or casserole. Remove to a crock pot or casserole. Add the remaining oil and sauté the onion until translucent. Add the garlic and sauté for a few seconds, then add the celery, rosemary, pureed and diced tomato, all the spices as well as the water and cook for 5 minutes. Put the eggplants on top of the lamb and pour the sauce on top. Cover with the lid and cook for 2 hours. Remove the lid and mix the food, so that lamb is now on top. Put it back in the oven, without the lid, reduce the temperature to 170oC and bake for fifteen more minutes or until the lamb browns on top. Serve with bulgur or rice pilaf and Greek yoghurt. A hearty and very delicious stew! Its Amazing food recipe i ever seen .. 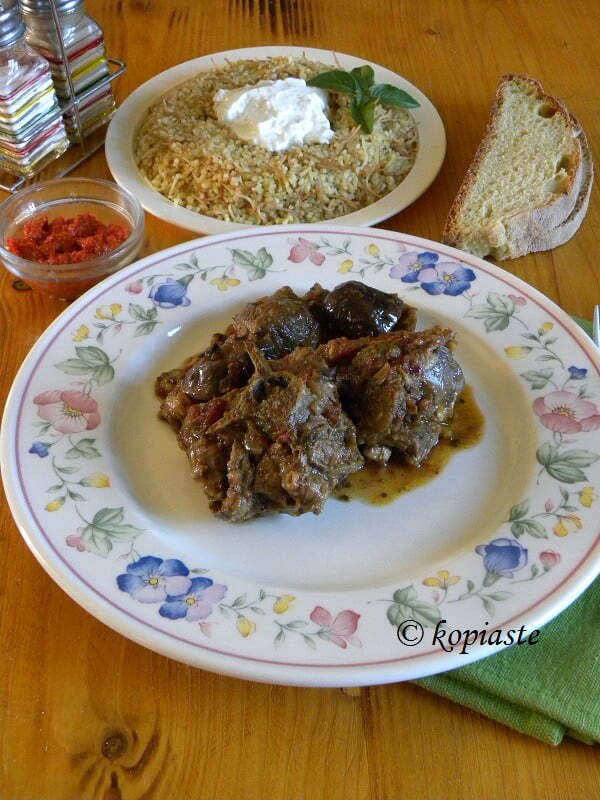 Awesome recipe about Greek Lamb and Eggplant Casserole.